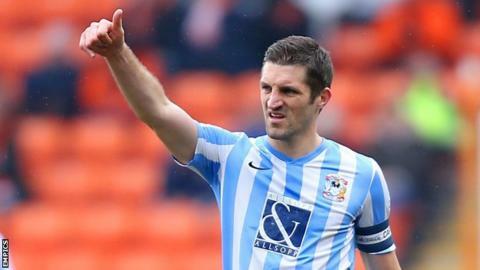 Former Wales defender and Coventry City captain Sam Ricketts has announced his retirement because of injury. The 35-year-old, who also played for Swansea City, Hull, Bolton Wanderers, Wolves and Swindon Town, is suffering from a knee problem and has decided to quit on medical advice. Ricketts made his final appearance in the Sky Blues' 3-0 defeat at Charlton on 16 October 2016. "It's been a fantastic journey," Ricketts said in a statement. He played 56 times for Coventry after joining them in the summer of 2015, having captained Wolves to the League One title in 2014. Ricketts was a promotion winner from League Two with Swansea and was also a member of the Hull side that won promotion to the Premier League for the first time during his three years on Humberside. "I am grateful to all of the managers, coaches and team-mates I have had the honour of working with and learning from throughout my career," Ricketts' statement continued. "I would also like to express my gratitude to the brilliant supporters of the clubs I have played at for always offering me their wholehearted support. "I have been hugely fortunate to ply my trade in every division from the Conference to the Premier League, and am immensely proud of having been capped by Wales on 52 occasions." Ricketts will continue working on his coaching qualifications with the Football Association of Wales.